We are a family owned and operated Mobil Ice Cream Parlor. We serve Cones, Sundaes, Malts, Milkshakes, Soda Floats, Freezes and Frozen Chocolate Dipped Bananas. Also, at large events or special order we have Gourmet Chocolate Chip Cookie Ice Cream Sandwiches. We do events, parties, and movies and television in Ventura and Los Angeles Counties. We do travel all over to events, including Big Hat Days in Clovis, Ca. 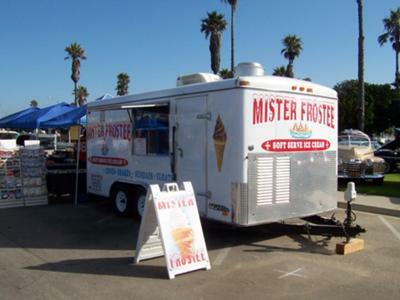 See us at our website, www.misterfrostee.com.